Braided line has revolutionized fishing in the last 15 years, Now you can have a 20-30 lb line on your reel, with a 8-10lb mono equivalent diameter and twice the yardage of line on your reel. But braided line can’t do everything, It is stronger and more durable, but it also stands out dramatically in stained and clear water. One way to get rid of this problem is by tying a mono leader to the end of your line. The mono leader not only gets rid of line visibility near your lures, it provides a shock leader and some level of stretch for the larger fish you catch. One trick I do is that when I tie a leader a tie a 4-5 foot section of leader, this eliminates the need for me to re-tie leaders after I switch lure and cut into it as often on the water, and provides a larger section of line not as visible to the fish. 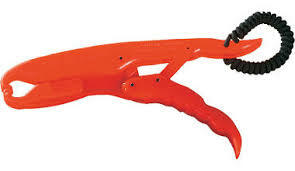 This saves time in my kayak and therefore gives me more time to target the fish. Here are the two easiest and in my opinion best knots that you can tie to go form a braided line to a mono leader. #2 The Blood Knot- A more difficult knot to tie but a stronger knot than the double uni. Hey everybody and thanks again for checking out the blog, today’s post will be covering Kayak Fishing 101, my 7 steps and tips to becoming a better kayak fisherman and also touching on some safety issues. A crowded kayak is no friend to a fisherman, snag hazards and frustration can set in quickly, and if there is one thing I have learned form kayak fishing over the last 8 years it’s that if something can catch your hooks, it will. If something can go wrong during your trip, it probably will. I have hooked myself, bird-nested bait casters to the point of cutting all my line off, and broke rod tips by hooking my rod behind me. 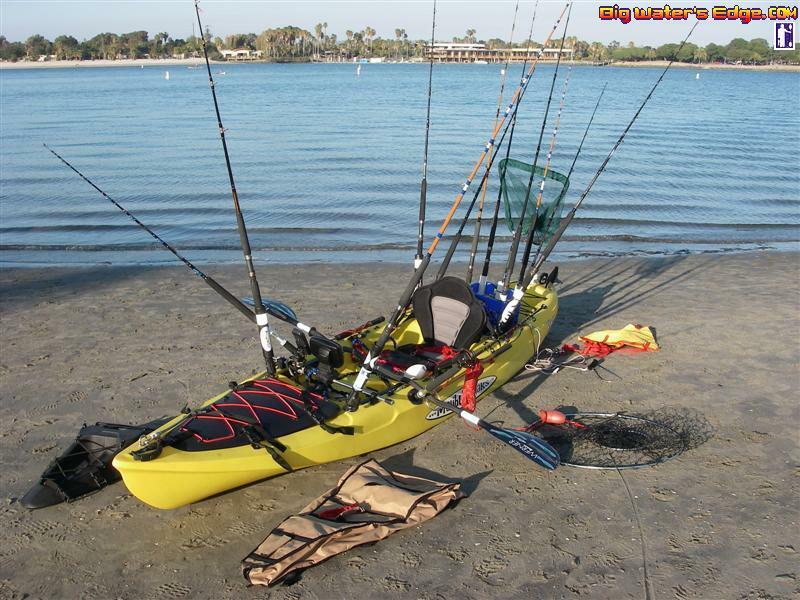 A simple less crowded kayak will result in less gear but pay off in the quality and enjoyment of your fishing trips. A USCG float plan might sound stupid , but in my 7 years of serving the the Coast Guard performing search and rescue nothing helps in a speedy recovery more than properly filled out float plan. A float plan consists a complete description of your vessel/kayak, the equipment you have available to you, but mainly focuses on your planned route and stopping points. 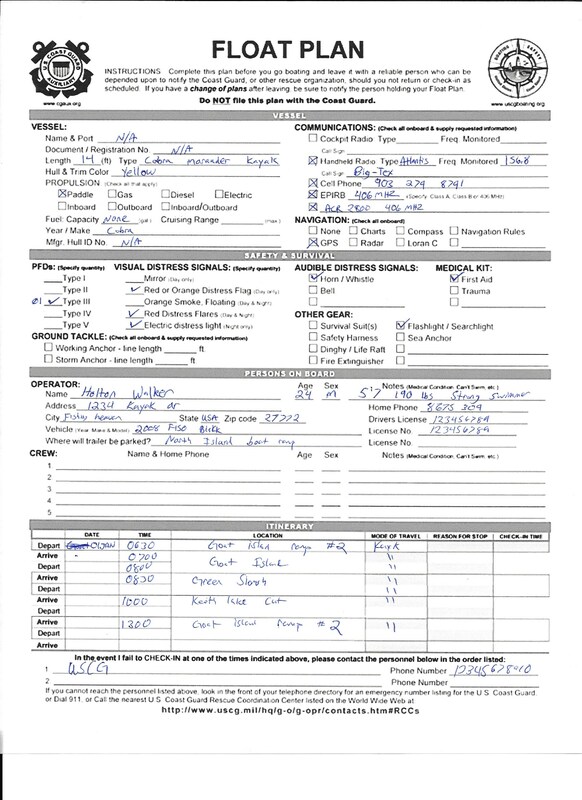 When you fill one out you leave it with a family member or friend and if you haven’t returned by a certain agreed upon time they call the coast guard with the information given on the float plan. Below I have filled out and example and there is a page on my main menu with a blank float plan you can save to your computer. The most important thing to have on your kayak is a handheld VHF marine radio set to CH 16 or 156.8 MHZ for distress signals. You might not be the person who needs help another kayaker could be close by and having an emergency and you could be his or her saving grace. The safety equipment I have on my kayak at all times consists of the following. An Atlantis VHF handheld radio, a Orion marine emergency signaling kit, a Firefly strobe light, my PFD, emergency water and next month I will be purchasing a 406 MHZ personnel locator. A good trick I learned form watching Ty Southerland on his 30Milesout Youtube Channel is I use frozen water bottles as my ice , it cools my catch and also serves as my emergency water rations. #4 If you’re new to kayak fishing, try to reach out and go on trips with more experienced yak fisherman. A beautiful factor of today’s technological world is the availability of kayak fishing forums on the internet and group pages on Facebook. If you are new to the sport its best to learn and shadow other fisherman you can go fishing with or meet on kayaking forums. Make no mistake their experience will teach you everything they have learned not to do over the years, saving you from making some of the mistakes and learning hard lessons along the way. Plus you might be able to get a couple of spots to fall back on during slow days. 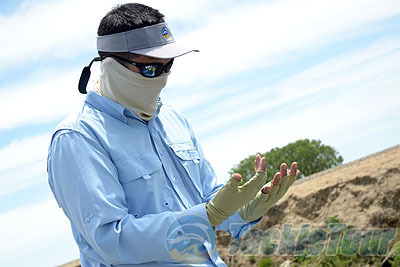 Sometimes people look at me funny when its 80 degrees outside, and I’m wearing full fishing pants , a long sleeve fishing shirt, a hat that covers my neck, a buff that covers most of my face, and Buffusa.com’s performance gloves, but at the end of the day I’m more protected from the sun, not burnt, and have a less chance of developing skin cancer from my kayak fishing trips. Every male member of my family has had melanoma skin cancer from fishing ,so I take it very seriously. My love is saltwater fishing, whether I’m fishing the flats or paddling offshore for some larger species I love saltwater fish. But there are plenty of days where I can’t drive to the beach 45 minutes or I can’t dedicate a long period of time for a trip. If I can’t fish saltwater I will immediately target bass and panfish in the creeks and rivers by my house. My favorite way to target bass and panfish is with topwater or floating flies. I even fish large ponds in my kayak when I can’t make a big water trip. Be very adaptive and try new places and styles of fishing. There are many days where your primary target species isn’t going to bite and you have to adapt. There is nothing wrong in my book with spending a day catching large ladyfish and jack’s or false albacore. Although they are considered trash fish by most people, large Lady Fish are some of the best fighting fish you can catch inshore. #7 Should I use a GPS/ Depth Finder? A good GPS/Depth-finder is one of my favorite things about my kayak, I don’t have to guess the bottom features of my surrounding areas, I can easily target structure listed on navigational charts, and I can view the depth fish are active in when fishing structure or even drift fishing along in my kayak. 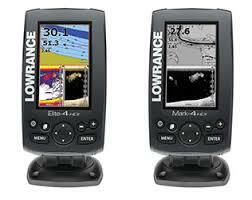 My GPS unit is a Lowrance Mark 4 HDI, I used it in my aluminum boat for duck hunting and fishing before I sold it with the arrival of my daughter in November 2014. My favorite way to utilize my depth finder is when targeting fish around bridges and submerged structure, I can clearly see the bait suspending and can adjust my rigs and presentation accordingly to better target the predatory fish on structure. I hope these tips better help you understand some basics on kayak fishing and I will have more posts on different types of gear and homemade items for kayak fishing in the future. Thanks for stopping by and good luck out there. Always remember to be safe, no fish is worth putting yourself in a dangerous situation or jeopardizing your safety. Please leaves comments below to help me on my future posts. How to catch fish in the outer banks. Hey everyone thanks for stopping by Apto Outdoors, the water and air temperatures are finally starting to warm up which means puffer fish and sea mullet are soon to follow. Today’s blog is going to be a short and simple article on the easiest ways for local surf fisherman and tourists to catch fish along the beaches of the outer banks. 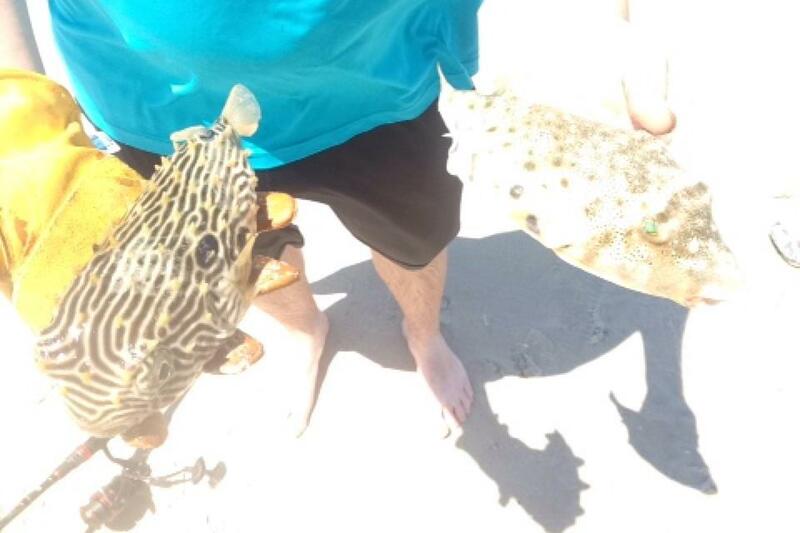 I have seen everything you can imagine used as natural bait for saltwater fish. The number one bait to use in my opinion is dead shrimp. It will catch just about everything. If you want to spice it up I add a piece of fish bites shrimp flavored pink artificial bait to the hook as well. What rigs do i need to use? A simple bottom rig with a 2-5 oz pyramid weight and no. 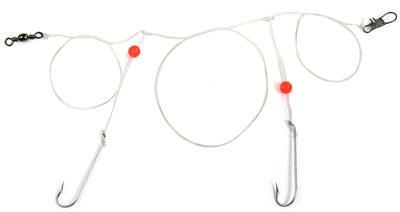 2 long shank hooks will catch everything from puffers to skate to red drum. The smaller the surf the less weight you need to use. Where do i need to go to fish. The easiest way for tourists is to go to a pier because your fishing license is included in your pier fee. But don’t be fooled, you can catch fish anywhere from the beach as long as your are putting your line in the water. My favorite spot is the Coquina beach access area. 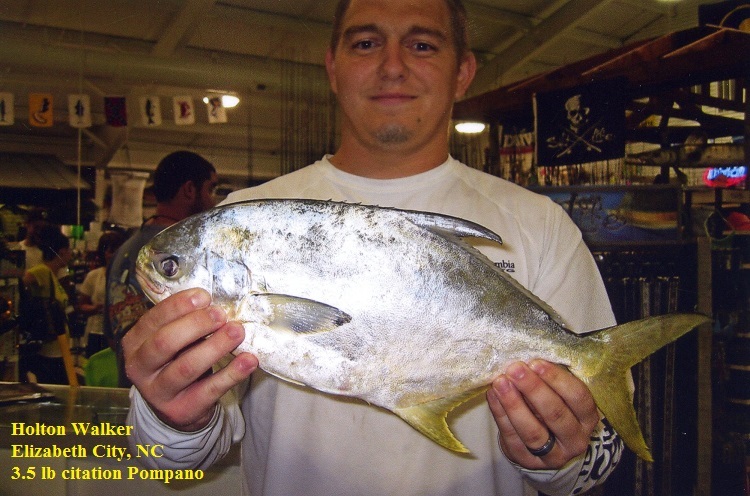 Colder water can catch tons of whiting and puffer fish, otherwise called “sugar toads” in NC/VA, and warmer waters in the summer and early fall yield spanish bluefish and good size pompano. North Carolina Citation pompano on sand fleas. 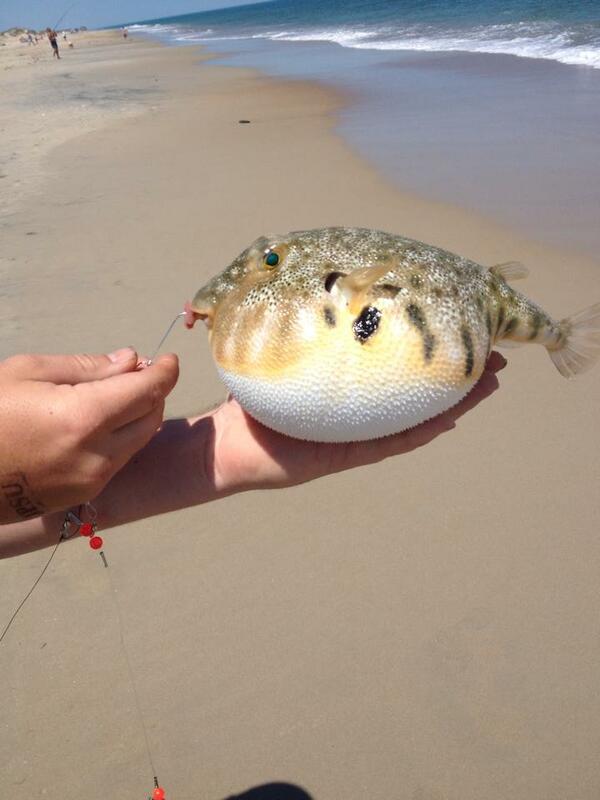 Can i eat a puffer fish in NC? Yes i love to eat the NORTHERN PUFFERS, they are not lethally poisonous but there bile can still cause some serious food poisoning. Below are the pictures of a northern puffer vs a horned puffer. ONLY EAT THE NORTHERN PUFFERS. One of my favorite ways to catch fish is to put a small piece of shrimp or a sand flea on a small hook, about 2 feet under a popping cork and i fish it just past the beach break. It produces fish consistently and is a lot of fun for younger fisherman and your kids. Horned Puffer on left – Northern Puffer on right. Getting ready for a new season of fishing. Hey everyone and welcome back to AptoOutdoors, Today’s blog is going to cover getting your gear ready for fishing after a winter of sitting in the garage. Braided line has a tendency to weaken and fade after a season of use. An easy trick to avoid 45 dollars of new line for each spool a rod using the braided line from another . You are essentially putting the old line at the base of the reel and utilizing all the perfectly good line that was buried the previous season. For fly fishermen and mono users go over your line very carefully, if you think it could be replaced it probably needs to. Make sure your tackle box is stocked again with what you use the most. For me what I go through the most is saltwater hooks, bottom rigs and popping corks. Go over your lures and see if any treble hooks need to be replaced. A common practice that has been hitting big with saltwater fisherman is to replace the treble hooks on topwater lures and suspending lures with circle hooks, providing an easier hook removal and survival probability for under-sized fish. A set of Fish Grips is something I consider an essential item. It doesn’t matter if I am fishing Freshwater or Saltwater, Inshore Or Surf, I will always catch something I don’t feel like touching or putting my hand near its mouth. Fish that come to mind are Pickerel, Bowfin, Snakehead, Rays, Speckled Trout, Flounder, Sharks and other species make you cringe and really wish there was a way to get your favorite lure back. Fish Grips make that happen by providing a great way to firmly grab the lip of a fish and remove the hook or lure with ease. 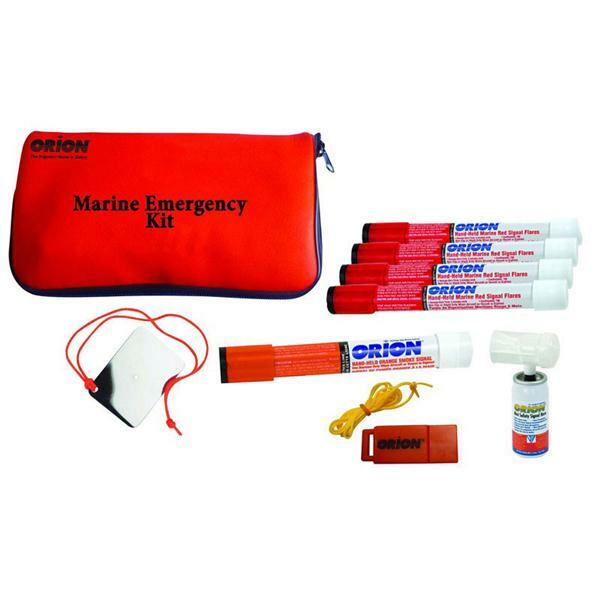 If you don’t own a good first aid kit buy one, if you don’t have a CPR Mask or device Buy one, if not for the safety of the people on your boat do it for the other boaters who you will find having a bad day. We are all out on the water together regardless if someone is in your spot or acting a fool when bad things happen its better to be prepared. I can’t count how many times we have pulled our boat to someone flagging us down to find a wade fisherman stung by a stingray , and old man who hooked himself, my dad even pulled up to a drifting boat to find a 70 year old man clinging to the other side of the boat’s rails. His anchor had broke free while he was wade fishing and by the time he grabbed hold of the rails he hit a drop off and his waders filled with water. Always be prepared to help out other fisherman. if something on the water does’t look right it probably isn’t right and you should always go check it out. In conclusion one of the most important things to do is get out and fish. New structure is waiting to be found, new honey holes ripe for the taking, and good memories are waiting to be made this summer. So go out have fun, catch fish, but most importantly remember to be safe. No fish is worth risking putting yourself in a sketchy situation. Thanks for reading and come back next week. 2015 Apto Outdoors Bucket List. Hey everyone and thank you for swinging by. Today’s quick post is covering the yearly goals or the “Bucket List” for the blog and youtube channel. As soon as i can start getting out on the water and getting videos there will be episodes on YouTube. below is the month by month Bucket List. Crappie- catch a 1lb or larger crappie on the fly rod.